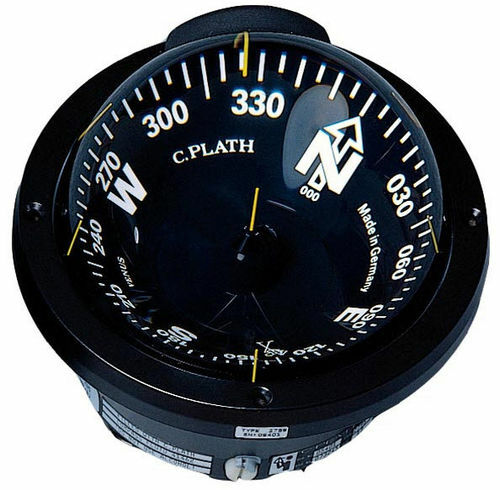 This C-Plath Venus H compass with a 5° card. It can be flush mounted in the cockpit floor, helm station, deck, or steering pedestal of large motor and sailing yachts. The Venus Compass H is manufactured in Germany by C. Plath and is built to function reliably in environments where strong vibrations, saltwater, heat, humidity, and cold are the norm. The black housing is seawater resistant and made of a light alloy. The super-strong glass dome is insensitive to ultraviolet rays, and is guaranteed for life against cracking, crazing, and yellowing under normal use.